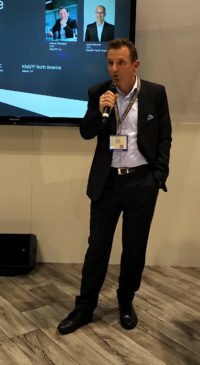 CHICAGO – Knapp took the wraps off an expanded partnership with micro-fulfillment innovator Takeoff on Monday at ProMat and shared details of a massive new DC it is outfitting for Digi-Key. Knapp and Takeoff announced their initial partnership in 2017 and have now confirmed a US$150 million, 50-site order for Knapp. Takeoff offers a micro-fulfillment solution that allows grocers to fill orders faster and at a fraction of the cost of traditional methods. Takeoff’s solution is powered by their grocery expertise and technology, paired with KNAPP’s history of automation leadership. The two companies are implementing a second-generation design that will increase throughput and reduce friction in the construction process. One key element of this design is a new open-shuttle technology that will optimize the space needed for order sorting, while adding flexibility to the overall design and operation of the micro-fulfillment centre. In addition to these upgrades, Takeoff is assembling dedicated implementation teams that will allow them to deploy multiple sites per week. “It is extremely exciting to take our partnership between Takeoff and KNAPP to the next level, and deliver on our promise of reliability, affordability and scalability,” said José Vicente Aguerrevere, co-founder and CEO of Takeoff. 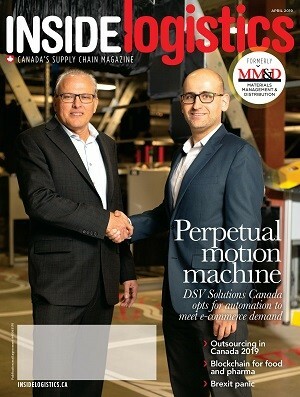 Minnesota-based Digi-Key Electronics distributor is building a new 2.2 million square foot distribution centre and will be installing over 1,000 of Knapp’s goods-to-person OSR Shuttle systems to move and store over 1.86 million SKUs when completed. Once installed, this system will be the largest of its kind completed by Knapp. 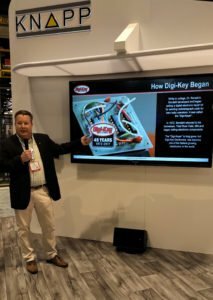 Digi-Key’s vice-president of order fulfillment, Chris Lauer, shared a little of Digi-Key’s history, from its start in 1972 with 36 parts up to the present with 1,748,000 individual SKUs. The company is located in a remote area of Minnesota, and is dedicated to the small town of Thief River Falls. Knapp will be working closely with the Digi-Key management team both during installation and after the system is on-line, to provide resident support to ensure a smooth startup and ongoing operation. According to Josef Mentzer, CEO of Knapp, the company expects to hire more than 60 skilled technical staff members to work in the Thief River Falls location during the coming months. “The Digi-Key project is one of Knapp’s largest and most important projects, and we are excited to partner with them to optimize their order fulfillment quality, performance and cost of operations,” he said. Digi-Key’s facility will have a total storage capacity of 2.7 million SKUs in stock and will be operational by 2021.